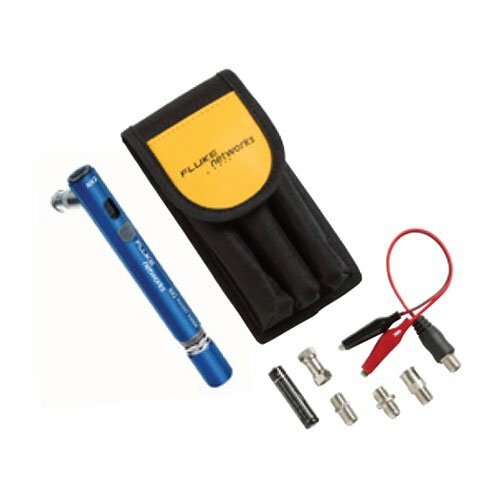 The Fluke Networks PTNX2-CABLE Pocket Toner NX2 Cable Tester Kit is Just like the adapters you need for quickly testing continuity, shorts, splitters, 50-75 ohm terminations and polarities in a compact hand-held case. Unique five-function 8-segment LED display as well as audio confirmation tools are pocket-sized, durable test devices that allow users to quickly and easily test voice, data, video cables for open and short circuits, and continuity. Included in the Fluke Networks PTNX2/CABLE, the Fluke Networks PTNX2 Pocket Toner NX2 tests VDV cables for continuity, AC and DC voltage (low voltage protection and verification up to 52 volts), opens, shorts, 50-75 Ω termination, and polarity with the optional Dial Tone detective adapter. The Fluke Networks Pocket Toner NX2 easily confirms if there is AC or DC voltage, an open circuit on the line, if a short exists or if continuity is achieved. The Fluke Networks Pocket Toner NX 2's key feature is the ability to know if the cable being tested is connected to any device with a voltage output of up to 52 volts.